No, this pub on Moorgate is not related to William Shakespeare. Its name actually comes from the globe which was used as the emblem of Portugal and advertised the fact that fine Portuguese wines were on sale at the premises. According the pub’s website, there were eight pubs with the sign of the Globe in London during the reign of King Charles I (when this pub was apparently founded). By the middle of the 19th century, the number had risen to more than 30. 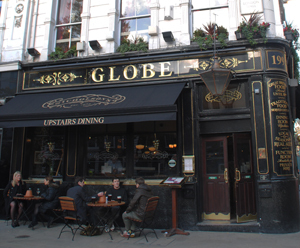 There are still a few other Globe pubs in London – as well as this one, others include the Globe in Marylebone Road and The Globe Bow Street (although we’re not sure whether their names were derived in the same way). The pub, which is located at 83 Moorgate – close to where Moorgate once punctured London’s city wall and gave access to the fens known as Moorfields. In 2008, the pub merged with the neighbouring pub, the John Keats, now commemorated in the name of the bar (that pub was named for the Romantic poet John Keats, who it has been speculated was born in a pub on the site in 1795). The pub is now part of the Nicholson’s group. For more, check out its website at www.nicholsonspubs.co.uk/theglobemoorgatelondon/.